Moist and light, this chocolate chip cake recipe is super easy to make! My entire family unites each Friday night around the dinner table. It's a time to catch up with one another and share the goings on of the last week. This week, I wanted to try something new and decided to bake this chocolate chip cake recipe for them. It's always interesting to see how they'll react to my baking. Well, I got the thumbs up with this cake...everyone loved it! It baked up moist and light and was a difinite keeper! Take my advice and give it a whirl. Then let us know how this chocolate cake recipe worked out for you or if you'd like one of your favorite recipes featured on our site, please drop us a line.! 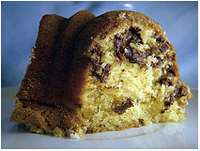 A big "THANKS" goes out to Addison for his amazing chocolate chip cake photo. 2. Grease a 13x9-inch pan. 4. Mix well by hand or use a mixer at medium speed for about 3 minutes. 5. Pour half of the batter (approximately 2 1/2 cups) into the prepared pan. 6. In a separate bowl, combine the sugar and cinnamon. 7. Sprinkle half of the sugar mixture and chocolate chips (1/2 cup) over the batter. 8. Repeat with the remaining batter, sugar mixture and chocolate chips. 9. Bake for 30-35 minutes or until a toothpick inserted in the center comes out clean.